Click on the chart above for in-depth premarket data. Wall Street is looking calm Tuesday, ready to digest another batch of earnings reports. 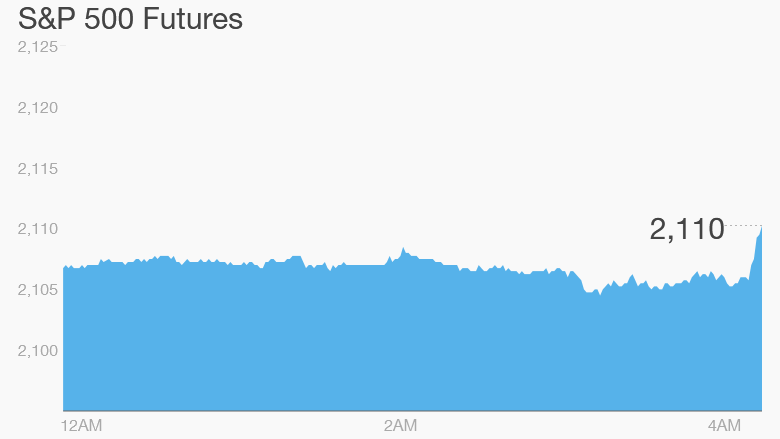 U.S. stock futures were inching up in early trading, following a mixed performance across international markets. 1. Earnings and economics: Earnings season continues with Disney (DIS), DirecTV (DTV) and Kellogg (K) due to report ahead of the open. Papa John's (PZZA) and Fossil (FOSL) release results after the close. On the economic front, U.S. March trade figures are due out at 8.30 ET. 2. International markets: European markets are moving higher in early trading, supported by strong earnings reports. Germany's DAX is leading the pack with a gain of about one percent. London's FTSE added 0.8% as trading resumed after a holiday and investors look ahead to the U.K. general election on Thursday. Shares in UBS (UBS) were on the rise, jumping 5% after the Swiss bank impressed with its first quarter earnings. Sportswear maker Adidas (ADDYY) put on nearly 3% in German trading after reporting a rise in first-quarter profit. Asian markets mostly retreated and Japan's Nikkei index was closed for a holiday. Australian shares closed flat after the central bank cut rates to a record low of 2% in an effort to spur growth. 3. Monday market recap: It was a firm finish across major U.S. indexes. The Dow Jones industrial average gained 46 points, while the S&P 500 rose 0.3% and the Nasdaq climbed 0.2%.